‘How long have you had this sleeping bag?’ My wife’s query was innocent enough. But I should have seen where it was going. “Oh man, more than 20 years!” I beamed. I’d bought the Marmot Pinnacle she was holding back when I worked at Midwest Mountaineering in the mid-90s. It was one of my first real gear purchases, scrounged together by scrimping and saving, and eating ramen noodles during college. It turned out to be a spectacular investment. I’d spent literally hundreds of nights in that bag. I was proud. “And when’s the last time you washed it?” she asked, sniffing the down sack while grimacing mildly. I deflated. I took a moment, thought about it, and looked away. There was no getting out of this one. 20 years of base-layer lint on the velcro. “It’s never been washed,” I admitted. Now that we’ve established that I’m nasty, I should point out that I know better. 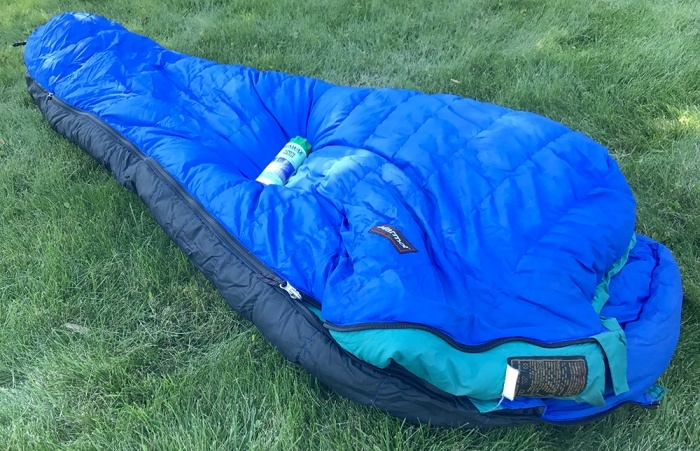 Down sleeping bags don’t need frequent washings. But they do need them, like, more than once a decade. 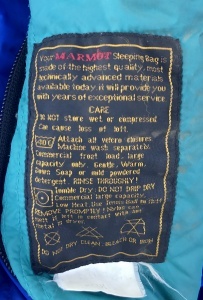 Note: Always refer to your manufacturer’s care instructions before washing the sleeping bag. Follow them if they deviate from these. Go to your closest laundromat. That is, unless you have a high-capacity tumble washer. Don’t use a typical home washing machine with a central agitator. You want one of the big, front-loading industrial machines that wash by spinning vertically. Remove detergent build-up from the detergent dispenser on the machine. It’s a pain, but bring a couple old towels to do the job. Or try to find a clean one. Place a maximum of two items in the washing machine. Add 100 ml of Nikwax Down Wash.
Wash according to the label if it has one. Generally, use a low setting and slow spin. Run multiple spin cycles, each time incrementally increasing the spin speed, to remove excess water. Dry in the dryer on low heat. Toss in a tennis ball to help re-fluff the down. Check regularly and tease out stubborn clumps by hand. It’s worth noting that, even if you hand wash your bag, you’ll still need a washing machine to spin it and remove water, and a dryer to tumble dry. Again, use Nikwax Down Wash Direct. 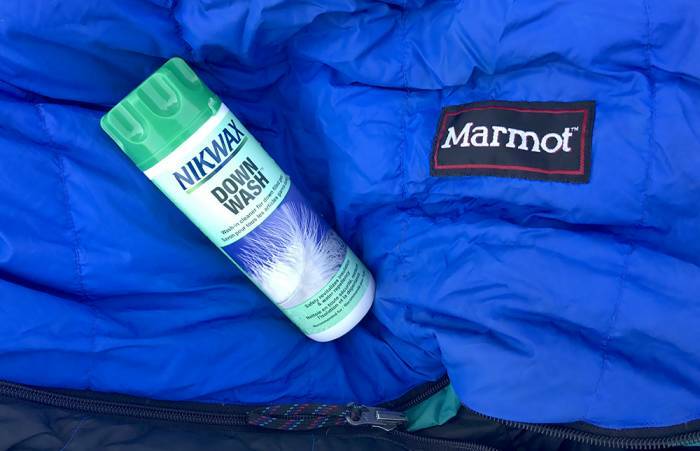 It’s made for washing down sleeping bags and jackets. Clean your bathtub or a large sink. Make sure to rinse it well to get out all soap and cleaning solutions. Fill the basin with about four gallons of cool water. Mix in 100 ml of Down Direct. 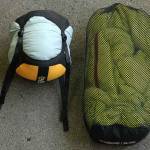 Place your sleeping bag in the tub and agitate by hand. Give it a good scrubbing. You know how dirty it is! Nikwax warns you to wear gloves. Place your bag in a washing machine for spin cycle only. This will help remove the bulk of the water. Start on the slowest spin possible to avoid damaging baffles. Dry it in the dryer on low heat. Toss in a tennis ball to help re-fluff the down. Check regularly and tease out stubborn clumps by hand. Tease apart clumped down to help it regain loft. Do this several times during the drying cycle. Don’t leave down wet or clumped. It can ruin the bag. Start your spin cycle as slowly as possible. The weight of wet down can tear internal baffles, so spin gently at first if possible. Check your bag’s care instructions for any other requirements. 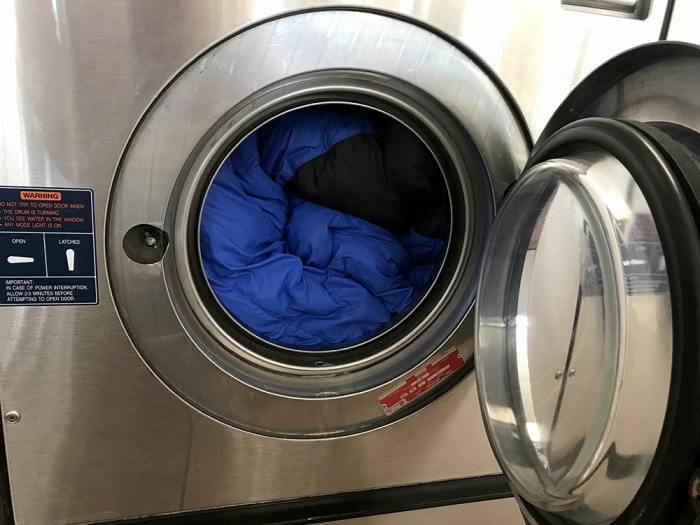 Ultimately, I spent about two hours at the laundromat to wash my sleeping bag. I drank one cup of coffee, did some writing, and winced while one baby cried wildly. After this brief chore, my sleeping bag now smells good. It’s all fluffy again and looks ready to serve another 20 years. I’ll update this article after sleeping in it for a test, but so far, it looks great. Maybe I’ll wash it a little sooner next time, though.